In this post, I’m going to walk you through a simple spring wreath tutorial that will remove the intimidation factor and make you want to make a wreath for every season and every room of your house. If you’re like me and you dream of being able to whip up something pretty to adorn your home, you know that it can sometimes be intimidating. So, before I set out to the store to find the materials to make my wreath, I went to the one place that millions of people go to for inspiration: Pinterest. 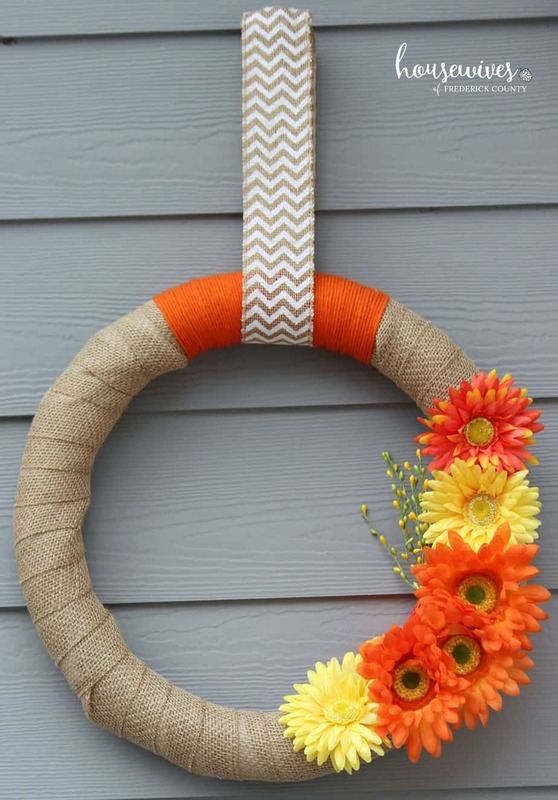 You would not believe the plethora of ways you can create a wreath. 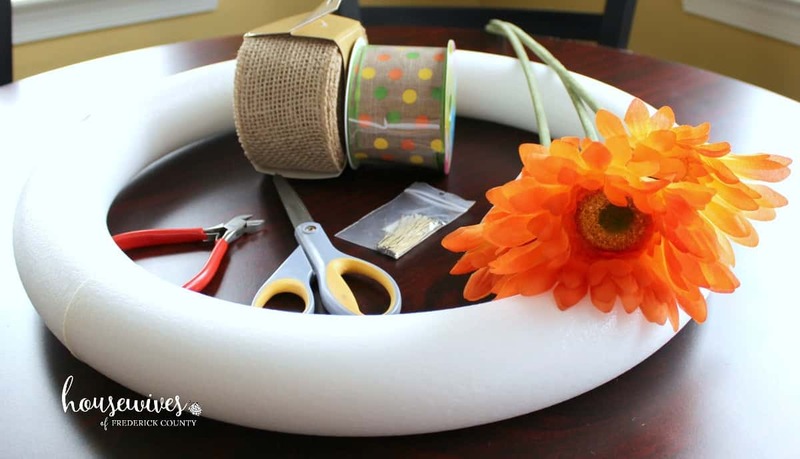 First, there’s a huge variety of wreath forms you can use: foam, grapevine, wire, metal, cardboard, straw, wooden, pine cone, and even pool noodles and garden hoses! Then there’s the method of how you decorate the base of your wreath: burlap wrapped, yarn wrapped, deco mesh, crochet flowers, felt flowers, wooden flowers, moss covered, yarn pom poms, twine, raffia, ornaments, the list goes on and on. So I was a little bit overwhelmed when I walked into my local A.C. Moore. 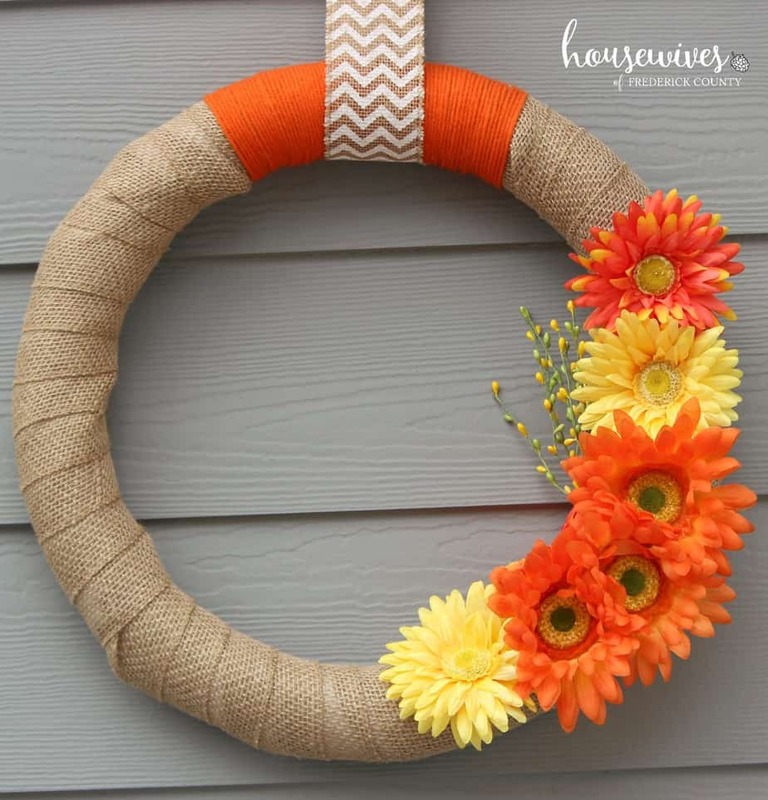 All I knew was that I wanted to make a burlap ribbon wrapped foam wreath and add pretty flowers and a pretty ribbon to it. Unfortunately, you may not find all of the materials you want all in one place. I ended up going to 3 different local craft stores, A.C. Moore, JoAnn Fabrics, and Michaels to get what I was looking for. OR you can purchase most of what I used for my wreath from Amazon. I included a detailed list of materials at the end of this post. 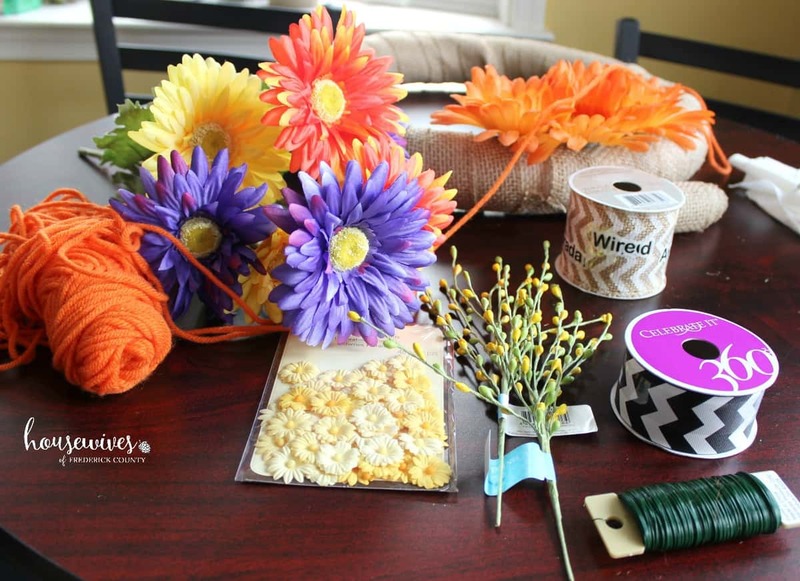 Initially, I bought a styrofoam wreath, 3 artificial flowers, and a spool of polka dot ribbon. I liked how the polka dots in the ribbon matched the colors in the flowers. I hadn’t totally prepared myself with how to attach the burlap ribbon to the wreath form. Turns out you need floral wire cut into 2 inch pieces and curved into a ‘U’ shape in order to push through the burlap and attach it to the foam form. Or you can buy the pins already made. 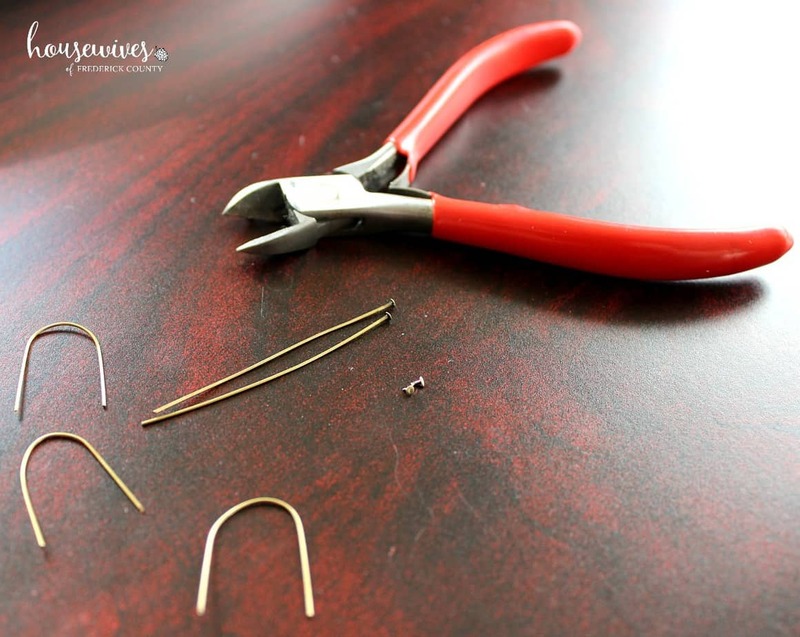 I didn’t have floral wire, but because I’m pretty resourceful, I used brass head pins, from my previous life as a jewelry designer, and snipped the heads off with my handy jewelry wire cutters. 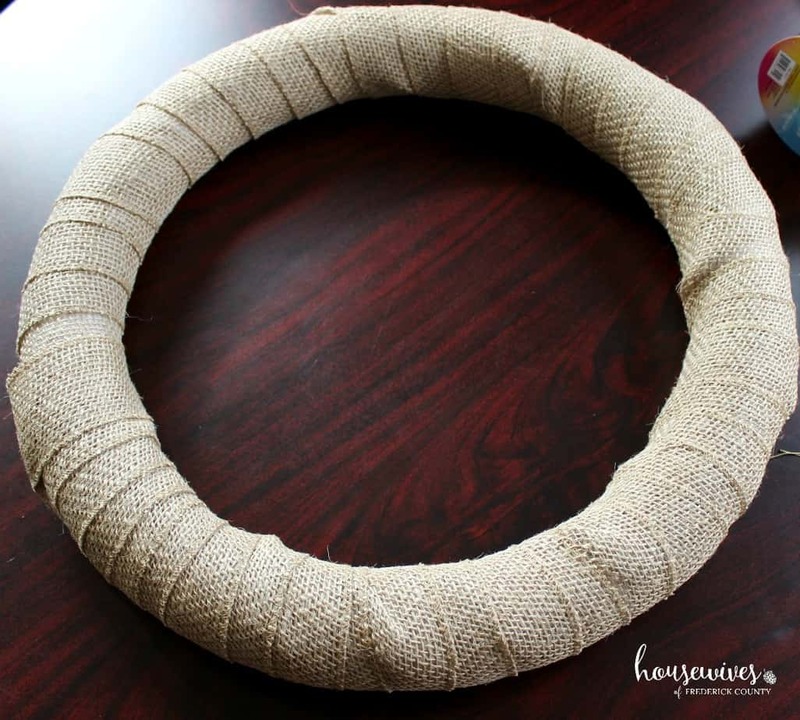 Wrap the burlap ribbon snugly around your styrofoam wreath. With your first wrap, secure a ‘U’ pin to the back of the wreath. Keep wrapping and use your pins to secure the back side of the wreath every 3 to 4 wraps. Here’s a close-up of what the pins look like pushed through the burlap to secure them to the foam. 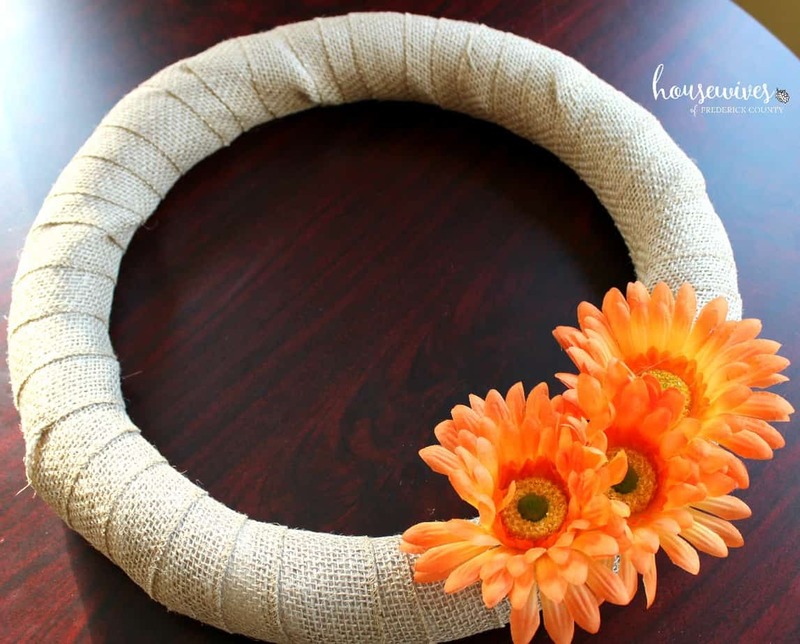 After your styrofoam wreath is wrapped with the burlap ribbon, then you can start decorating. Make sure you have a plan before you begin using your glue gun because once your decorations are glued, there’s no changing up the design. Using my wire cutters, I cut the stems off the artificial flowers all the way to the base of the back of each flower. I then added hot glue to the center of the back of the flower and pressed it onto my wreath. I originally bought only 3 artificial flowers. Once they were glued to my wreath, I realized I needed more to make it look complete. Plus, I really didn’t like the polka dot ribbon on the wreath. It just didn’t ‘pop’ enough. So, off to the store I went! This time I went to Jo-Ann Fabrics. 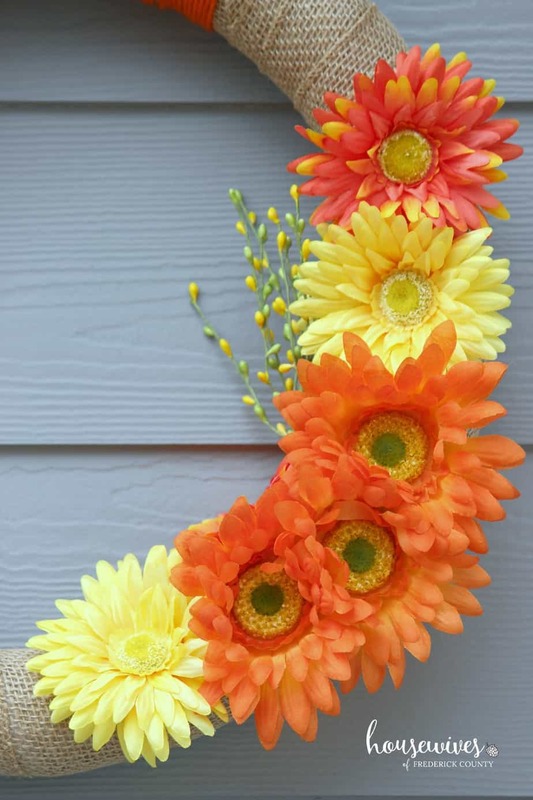 I found more flowers and decided I wanted some yellow flowers mixed in with the orange flowers. The purple flowers were part of the bunch of flowers, but I didn’t use them. I also wanted some sort of berry sprig to mix it up a little with the flowers. I bought 2 but only used one ‘pick’ of the yellow berries. I glued the ‘pick’ part to the inside edge of the wreath and then glued a flower over the pick for it to look nicer. I thought the package of yellow daisy buttons was super cute, but I ended up not using them for this project. I wanted a chevron ribbon, so I bought 2 colors, but went with the burlap and white. I decided to use some orange craft yarn to break up the monotony of the beige burlap. I really love the look of a fully yarn wrapped wreath (maybe my next project?). So I decided to add a block of wrapped yarn to the top of my wreath. Pull up a chair and start wrapping. Use your glue gun to attach the first piece of yarn to the back of the wreath in the spot you want the yarn to start (I used a sharpie to mark the back of the wreath where I wanted the yarn to start and end). 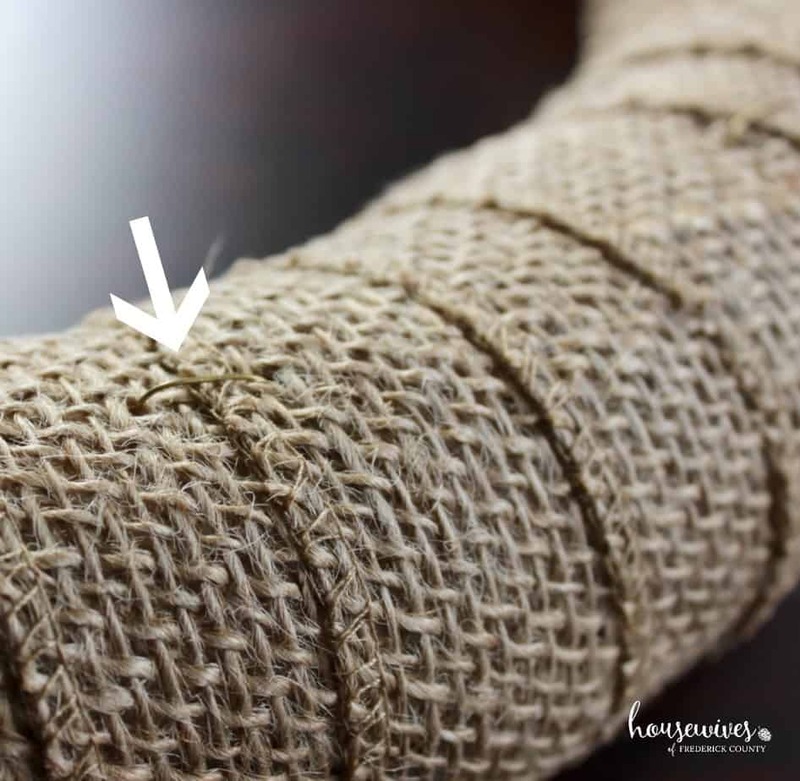 Then when you’re finished wrapping the yarn, cut the end and use your glue gun to glue the end. I cut mine to be about 36″ long (give or take) and wrapped it around the top of the wreath. I glued the edges together and used a nail through the center to attach it to the wall. I’m super happy with the way it turned out. I absolutely love the color orange but didn’t want something too busy and detailed. This turned out just the way I wanted it. 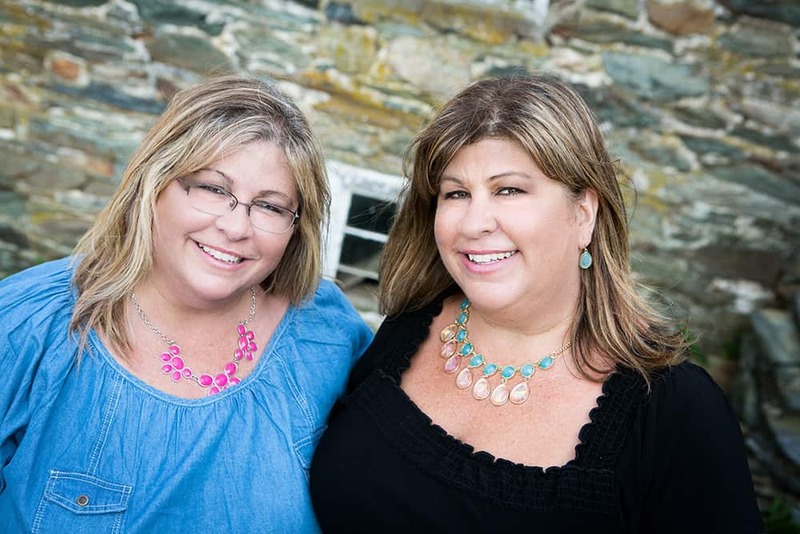 Thanks to Terri for giving me constructive feedback throughout the process. I’ve now gotten over my feelings of intimidation and see more DIY wreaths in my future! Here’s a list of all of the supplies/materials I used for this project. Keep in mind you’re going to have leftover materials that you can save in a box for any future projects. 18″ white styrofoam extruded wreath – (Got mine at A.C. Moore) Here’s one just like it from Hobby Lobby for $6.99. Same price I paid for mine. 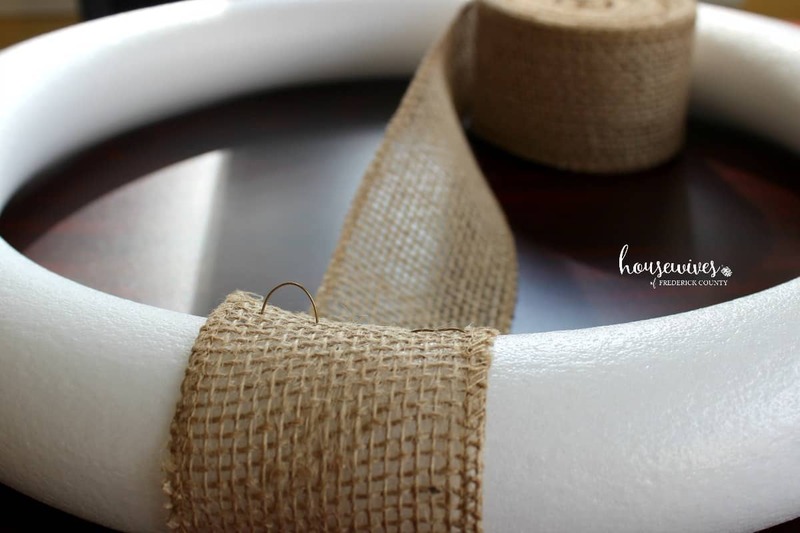 2 1/2″ by 10 yard burlap ribbon – (Got mine at A.C. Moore) You can get this on Amazon for $6.22. Green florist wire (24 gauge, 1/4 lb) – Got mine at JoAnn for $2.49 (too expensive on Amazon). Glue gun & glue sticks – (Already had mine) You can buy one, glue sticks included, from Amazon for $12.82. Wire cutters – (Already had mine) Check your hubby’s toolbox or you can get them on Amazon for $14.97. Artificial flowers – Got mine at A.C. Moore & JoAnn totaling $14 but you can get 12 of them on Amazon in different colors for $11.99. Craft & Rug Yarn, 43 yards – Got mine at JoAnn for $2.49 but you can find a pack of 8 different colors (65 yards each) on Amazon for $13.97. If you know you’ll be making more than one wreath, this is a deal. Berry sprig pick – Got mine at JoAnn for $1.19 per pick. Couldn’t find them on Amazon except in bulk. Wired white chevron burlap ribbon, 2 1/2″ by 3 yards – (Got mine at Michaels for $4.99) You can get this on Amazon for the same price. 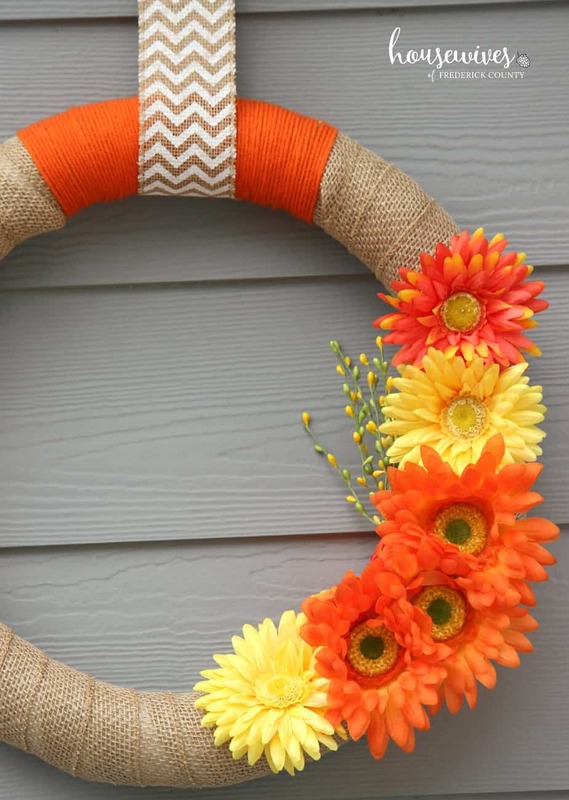 There are literally an unlimited variety of ways you can create a wreath. Feel free to use my design, using your favorite colors, flowers and ribbon. 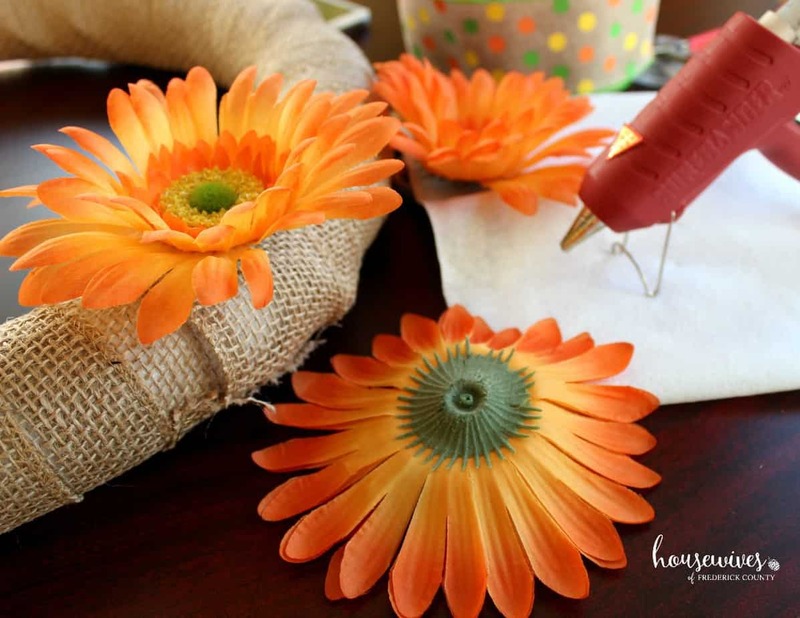 What DIY spring projects do you gravitate to?